Safely and easily remove heavy imperfections with ease! The P&S Ballistic Compound Max Cut Compound is a heavy corrective compound, designed to remove heavy imperfections with ease! Heavy imperfections can be tough to remove, especially when you are dealing with harder paint finishes or gel coats. P&S had these types of finishes in mind when developing Ballistic and paired heavy correction ability with long work time and lower compounding haze output. This formulation allows you to remove 1000 grit sanding scratches or finer, oxidation, fallout, water spots, and other imperfections safely and easily. You can use it with a rotary or a dual action polisher and with either wool or foam cutting pads. It is safe for use on all paint finishes and works fast and easy, with easy excess polish removal. 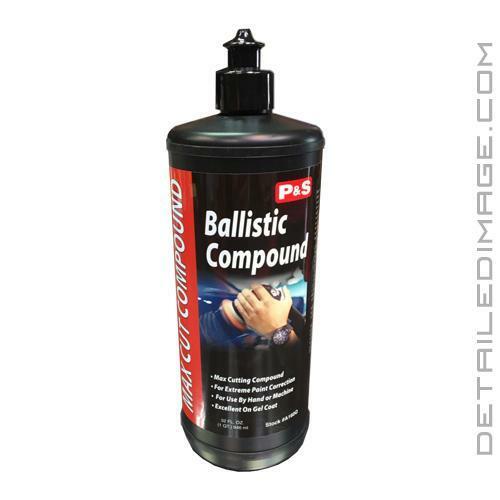 If you are looking to remove ugly, heavy imperfections, the P&S Ballistic Compound Max Cut Compound is a great item to add to your detailing collection! Ballistic Compound is a max cut heavy duty compound designed to provide sufficient cutting capabilities for use on harder paint finishes and gel coat. Ballistic was developed to remove 1000 grit sand scratches or finer, oxidation and surface defects from all types of finishes. Ballistic Compound may also be used to remove oxidation, fallout, water spots and other surface irregularities. Ballistic Compound prepares the surface for the finish polishing step. Use with conventional wool pad or foam pad depending upon desired results. May be used with both rotary and high action D/tools. Shake product well prior to use to disperse active ingredients. Apply sufficient product to the painted surface to buff a two foot by two foot area. Begin buffing at 1000-1500 RPM. Use medium pressure until compound begins to dissipate, reduce to light pressure and buff until smooth finish. Use long, even buffer strokes to minimize swirl footprint. Spur or clean pad as necessary to remove excess product. Note: To eliminate the possibility of staining, do not apply in direct sunlight or onto hot surface.